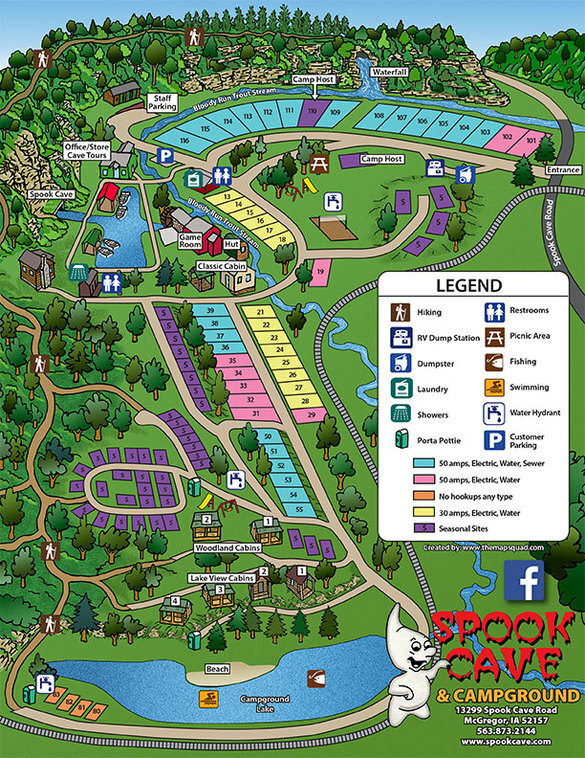 Spook Cave, Cabins & Campground - Monona Chamber & Economic Development, Inc. Spook Cave is situated right in the heart of the Driftless Area in Northeast Iowa. Disappearing streams occur where surface waters sinks down into the earth through fractured bedrock or a sinkhole, either joining an aquifer, or becoming an underground stream. Blind valleys are formed by disappearing streams and lack an outlet to any other stream. Sinkholes are the result of the collapse of the roof of a cave, and surface water can flow directly into them. Disappearing streams can re-emerge as large cold springs. Cold streams with cold springs as their sources are noted as superb trout habitat. 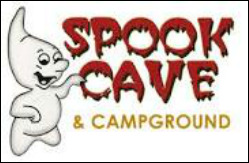 Spook Cave provides fun family entertainment every day 9 a.m. to 5:30 p.m. from May through October! Experience Spook Cave’s unique and fun underground boat tour! As your boat enters the base of a 90′ bluff, your guide explains the discovery, development and history of the natural limestone cave and area. View stalactites and other natural formations with plenty of photo opportunities. No walking involved, fully lighted, out of the weather . . . and always 47 degrees! We offer spacious primitive sites along with full hookups. Featuring a shower house, laundry and flush toilets. Enjoy your stay; lake swimming with a sand beach, Iowa State stocked Trout stream, lake fishing, hiking trails, playgrounds, sand volleyball, game room and gift shop. Locally handcrafted Amish Log Cabins; secluded and private; surrounded by trees, bluff, and lake; great view, sits on bluff overlooking Spook Cave lake; near trout stream; cabins sleep anywhere from 3 to 10 people. visit or call us at 563.873.2144.